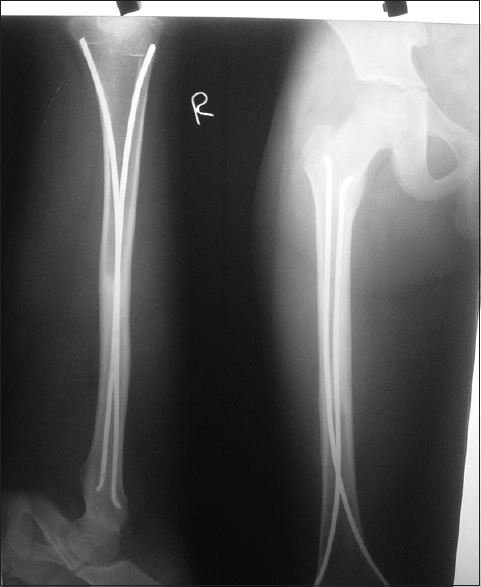 Femoral diaphyseal fracture is the most common orthopedic injury of the children. The treatment has conventionally been age-related, influenced by the type of injury, associated injuries and the location and the type of the fracture. To a larger extent, the treatment options vary according to the surgeon's preference. Due to the rapid healing and spontaneous correction of angulation, most of the diaphyseal femoral fractures in children younger than 4 years of age can be treated conservatively. 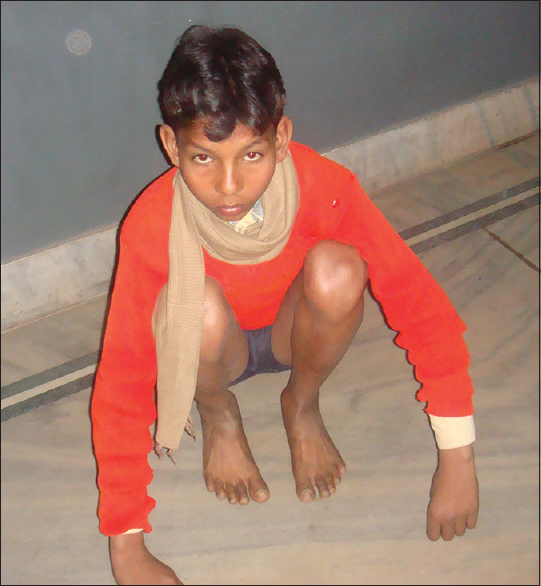 Above the age of 4 years, all such fractures when treated conservatively by traction followed by hip spica could have prolonged hospitalization, loss of reduction, malunion, intolerance, and complications associated with plaster-like toileting and personal hygiene difficulties as well as mental trouble to the parents. Near the end of the skeletal maturity, accurate reduction is necessary as angular deformity is no longer correctable by the growth. However, the best treatment between 4 and 16 years of age is a matter of debate. Since the last two decades, there has been a growing tendency toward a more operative approaches such as compressive plating, external fixation, and intramedullary nailing in children over 4 years of age., Enders nails or Rush nails have also been used, but these have poor rotational stability and require multiple nails to achieve fracture stability. Elastic either titanium/stainless nailing has become the choice of stabilization in diaphyseal femoral fractures in children. The advantages of this technique include early union due to micromotion at the fracture site, respect for the epiphysis, early mobilization and weight bearing, scar acceptance, easy implant removal, unnecessary child care, finally leading to high patient satisfaction rate., We report a prospective study of fixation of diaphyseal fractures of the femur in age group 4–16 years of children. 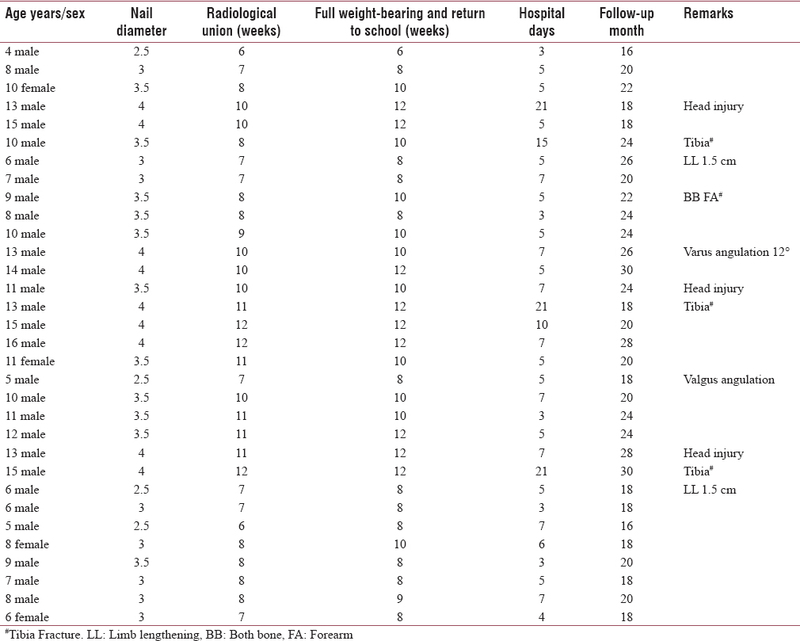 Thirty-two children, 25 boys and 7 girls in the age group of 4–16 years average 10.8 years with recent (<7 days) diaphyseal femoral fractures (30 closed, 3 Grade 1 and 1 Grade II) were fixed with stainless steel/titanium elastic nail (SES) from March 2013 to May 2017. Most of the fractures were due to Road traffic accidents. The right side was dominant in 23 cases (78%) and associated tibia fractures in ipsilateral limb were seen in 3 cases (%). Five fractures were in proximal third, 24 in the middle third and four in the distal third. 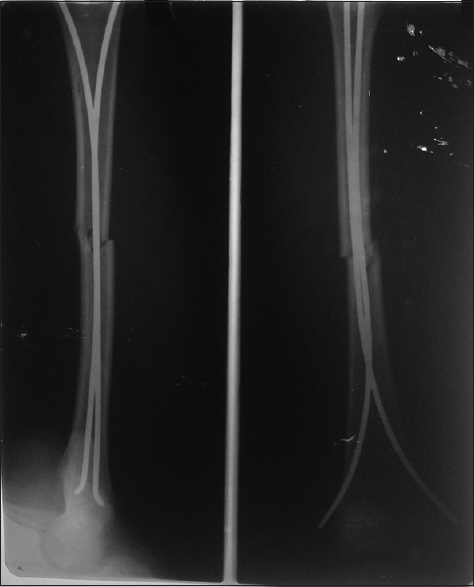 Twenty-five fractures were transverse, three minimally comminuted and four were short oblique fractures [Figure 1] and [Figure 2]. Majority of the patients were stabilized within 7 days of the injury under GA using IITV with the patient on the fracture table in supine position. Children from 4 to 6 years were manually reduced. The diameter of the individual nail was selected as per Flynn et al. 's formula (Diameter of nail = width of the narrowest point of the medullary canal on AP and Lateral view × 0.4 mm) as well as the intra-operative assessment. The diameter of the nail was chosen so that each nail occupies at least one-third to 40% of the medullary cavity. The patient was positioned on the fracture table with access to the IITV. The bone was exposed in retrograde fashion with medial and lateral incision 2.5–3 cm above the epiphysis and the soft-tissue spread in the same direction with the blunt type scissors. The periosteum was also incised longitudinally and the cortex exposed. With the help of sharp awl, outer cortex was perforated and the awl angled to enter the medullary cavity in the middle of the width of the cortex. Nails were prebent sufficiently so that apex of the bowed nail rested at the same level on the fracture site to ensure a good recoil force. Two stainless steel/titanium elastic nails of identical diameter were manually pushed with the help of a “T” handle until resistance was met and then gently inserted with the curve tip sliding on the inner cortex. Six cases required insertion of different diameter because of intraoperative difficulties in driving the second nail into the proximal fragment. Once across the fracture site, the nails were inserted into the metaphysis with the tips facing opposite directions to give three-point purchase in the Cancellous bone. In five cases, open reduction was required due to soft-tissue interposition and failure to negotiate the proper reduction. The nails were cut 1–1.5 cm long and bent to lie along the bony cortex to prevent skin and soft-tissue impingement. The median duration of surgery was 45 min (30–75 min). The mean hospital stay was 4 days (3–7 days). A patient with head injury had to stay for a longer period (21 days). The hospital stay was dictated by associated injuries and the adequacy of the fixation. Postoperatively, patients cared in the supine position and limb were kept elevated on a pillow. Slab/Brace were used in distal third fractures having inadequate fixation. Mobilization exercises without weight bearing started from the 5th postoperative day. Partial weight bearing was started from 4 to 6 weeks and full weight bearing by 6–8 weeks depending on the fracture chemistry, callus response and associated injuries. All patients were followed radiologically as well as clinically until fractures healed and for any complication. The results were evaluated using Flynn et al. 's scoring criteria for SEN12 [Table 1]. Routine removal of these implants were recommended 6–9 months after surgery when the fracture line was no longer visible radiologically [Figure 3], [Figure 4], [Figure 5]. Thirty-two cases did well postoperatively. All the patients were evaluated after a mean of 24 months (12–36 months) follow-up. Radiological union was achieved in all cases in a mean time of 8 weeks (6–12 weeks). Full weight-bearing was possible in 8 weeks (6–12 weeks). The results were excellent in 24 patients (75%), good in 5 (16%), and poor in 3 cases (9%) as per the scoring criteria by Flynn et al. We looked at the post-operative complications, healing time, rotational deformities, entry site irritation, infection, limb length discrepancies, the range of motion (ROM) of adjacent joints, and return to function. Two patients had varus angulation (6°, 12°), whereas one had valgus angulation (15°). Entry site irritation, ultimately, skin breakdown occurred in 5 patients, which lead to superficial infection, later treated with antibiotics. Leaving nail end long (2 cm) and untrimmed was significantly associated more with the entry site irritation. In 3 cases, there was overgrowth (about 1.5 cm) of the affected limb radiologically, but it was clinically insignificant. This needs further evaluation at skeletal maturity, as overgrowth may not correct with age. One case required removal after 5 months due to wound breakdown at the entry site. Results were better for children <10 years of age. Functional ROM of the knee was achieved in an average of 8.3 weeks (6–18 weeks). Intramedullary fixation has always been the preferred treatment technique in long bone fractures, even in adults, but their use in pediatric fractures was limited. The ideal treatment in children is defined as one that controls alignment and length, does not compress or elevate the extremity excessively, is comfortable for the child and convenient for the family and cause least psychological impact possible. Until recently, conservative treatment by skin traction followed by hip spica was the preferred method in children and adolescents. 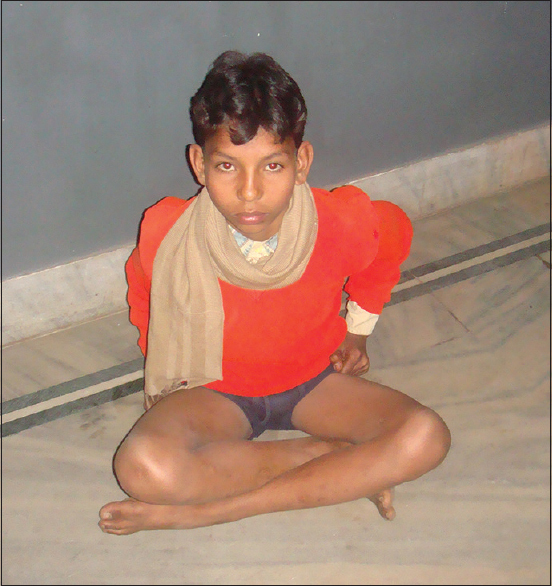 However, to avoid the effects of prolonged immobilization, to reduce the loss of school days and for better nursing care, the operative approach has been gaining popularity for the past two decades. Plate osteosynthesis is still widely used, but associated with big exposure, relatively longer duration of immobilization, infection, risks of delayed union and bigger dissection for plate removal. The external fixator provides good stability and early mobilization but associated with risk of pin tract infection, and it takes longer time for weight bearing. Intramedullary K wire fixation has also been used for pediatric femoral fracture, but stability and fracture angulation is a disadvantage to be taken care of. The interlocking nail is ideal for skeletally matured children. Reports of AVN of the femoral head, coxa valga has been reported with interlocking nail in skeletally immature patients. However, there have been proponents for using interlocking nail in 11–16 years group, avoiding pyriform fossa as entry site, with good results. There is no comparative study regarding the efficacy of Enders Nail, Rush nail, or Elastic nail. All the nails give good results. Ender nail and Rush nail have poor rotational stability and require multiple nails to achieve good fixation. Moreover, Ender nail is not elastic and flexible enough for pediatric fractures as stated by Ligier et al. Buechsenschuetz et al., documented titanium nail superior in terms of union, scar acceptance and overall patient satisfaction compared to traction and casting. Flexible elastic nail seems advantageous over other surgical methods particularly in this age group as it is simple, load bearing internal splint that does not violate open epiphysis, allows early mobilization, and maintains alignment. Micro motion conferred by the elasticity of the fixation promotes faster external bridging callus formation. The periosteum is not disturbed and being a closed procedure there is no disturbance of the fracture hematoma, thereby lessening the risk of infection. Flynn et al. found TEN as more advantageous over hip spica in treatment of femoral shaft fractures in children. Fracture geometry and location is an important determinant for selection of surgical techniques. Transverse, short oblique, and minimally comminuted fractures are suitable for elastic nail as stated by Flynn et al. Lascombes et al. stated that Elastic nail could be indicated in all femoral diaphyseal fractures of children above 6 years of age until epiphysis closed except severe type III open fractures. Elastic nail does not provide adequate stability in comminuted, long oblique, or spiral fractures. Narayanan et al. found good outcome in 79 femoral stabilized with Elastic nail. Narayanan et al. stated that transverse, short oblique, short spiral fractures with minimum comminution in the age group 4–15 years were the best indications for Elastic nails. The most common complication of Elastic nail is entry site irritation and pain. Other complications include limb length discrepancy, fracture angulation, refractures, and infection. In our series entry site irritation was seen in five cases. Entry site irritation was significantly associated with long and prominent nail end (>2 cm). Similarly, smaller and mismatch nail diameter, incidentally used in three cases was associated with increased incidence of varus/valgus angulation. All these findings were statistically significant. The principle of this procedure of intramedullary elastic nailing of femoral shaft fracture is to transform the fracture forces to compression forces and give three point fixation. This procedure is an effective, simple, and viable treatment option in diaphyseal fractures of femur in children in 4–16 years age, especially more in high speed trauma cases and head injury in which hip spica hinders the nursing of the patient and treatment of other injuries. Flynn JM, Skaggs DL, Sponseller PD, Ganley TJ, Kay RM, Leitch KK. The operative management of paediatric fractures of the lower extremity. J Bone Joint Surg Am 2002;84:2288-300. Heybeli M, Muratli HH, Celebi L, Gülçek S, Biçimoğlu A. The results of intramedullary fixation with titanium elastic nails in children with femoral fractures. Acta Orthop Traumatol Turc 2004;38:178-87. Metaizeau JP. Stable elastic nailing for the fractures of the femur in children. J Bone Joint Surg2004;24:172-7. Lee YHD, Lim KBL, Gao GX, Mahadev A, Lam KS, Tan SB, et al. Traction and Spica casting for closed femoral shaft fractures in Children. Journal of Orthopaedic Surgery 2007;15:37-40. Flynn JM, Luedtke LM, Ganley TJ, Dawson J, Davidson RS, Dormans JP, et al. Comparison of titanium elastic nails with traction and a spica cast to treat femoral fractures in children. JBone Joint Surg Am 2004;86-A: 770-7. Canale ST, Tolo VT. Fractures of the femur in children. J Bone Joint Surg Am 1995;77:294-31. Bhaskar A. Treatment of long bone fractures in children by flexible titanium nails. Indian Orthop 2005;39:166-8. Mann DC, Weddington J, Davenport K. Closed ender nailing of femoral shaft fractures in adolescents. J Pediatr Orthop 1986;6:651-5. Reeves RB, Ballard RI, Hughes JL. Internal fixation versus traction and casting of adolescent femoral shaft fractures. J Pediatr Orthop 1990;10:592-5. Buechsenschuetz KE, Mehlman CT, Shaw KJ, Crawford AH, Immerman EB. Femoral shaft fractures in children: Traction and casting versus elastic stable intramedullary nailing. JTrauma 2002;53:914-21. Flynn JM, Luedtke L, Ganley TJ, Pill SG. Titanium elastic nails for pediatric femur fractures: lessons from the learning curve. Am J Orthop (Belle Mead NJ) 2002;31:71-4. Staheli LT, Sheridan GW. Early spica cast management of femoral shaft fractures in young children. A technique utilizing bilateral fixed skin traction. Clin Orthop Relat Res 1977;338:162-6. Ward WT, Levy J, Kaye A. Compression plating for child and adolescent femur fractures. J Pediatr Orthop 1992;12:626-32. Aronson J, Torsky EA. 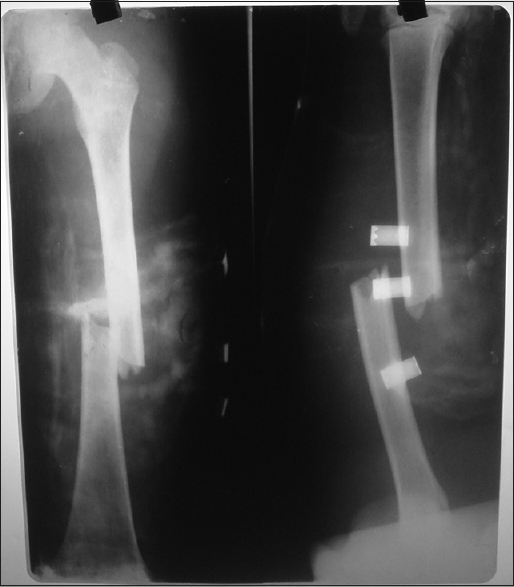 External fixation of femur fractures in children. J Pediatr Orthop 1992;12:157-63. Pradeep K, Gaur SC, Shrivastava DC, Vashishth R. Closed intramedullary k-wire fixation of femoral shaft fractures in children. Indian J Orthop 2001;35:242-4. Beaty JH, Austin SM, Warner WC, Canale ST, Nichols L. Interlocking intramedullary nailing of femoral-shaft fractures in adolescents: Preliminary results and complications. J Pediatr Orthop 1994;14:178-83. Letts M, Jarvis J, Lawton L, Davidson D. Complications of rigid intramedullary rodding of femoral shaft fractures in children. J Trauma 2002;52:504-16. Ligier JN, Metaizeau JP, Prévot J, Lascombes P. Elastic stable intramedullary nailing of femoral shaft fractures in children. J Bone Joint Surg Br 1988;70:74-7. Barry M, Paterson JM. A flexible intramedullary nails for fractures in children. J Bone Joint Surg Br 2004;86:947-53. Lascombes P, Haumont T, Journeau P. Use and abuse of flexible intramedullary nailing in children and adolescents. J Pediatr Orthop 2006;26:827-34. Narayanan UG, Hyman JE, Wainwright AM, Rang M, Alman BA. Complications of elastic stable intramedullary nail fixation of pediatric femoral fractures, and how to avoid them. J Pediatr Orthop 2004;24:363-9.